When you picture hot fun in the summertime, a big backyard party is bound to be right up there. Family, friends, food, fun, and maybe a few firework sparklers thrown into the mix. It’s a summer staple. But a lot of people dread throwing a backyard party, simply because of the amount of work it can be. Who wants to host a party where you’re running around working all the time instead of enjoying yourself? It honestly doesn’t have to be that complicated. Throwing a hassle-free party is entirely possible, and can actually be fun when you know how to plan one properly. Not convinced? 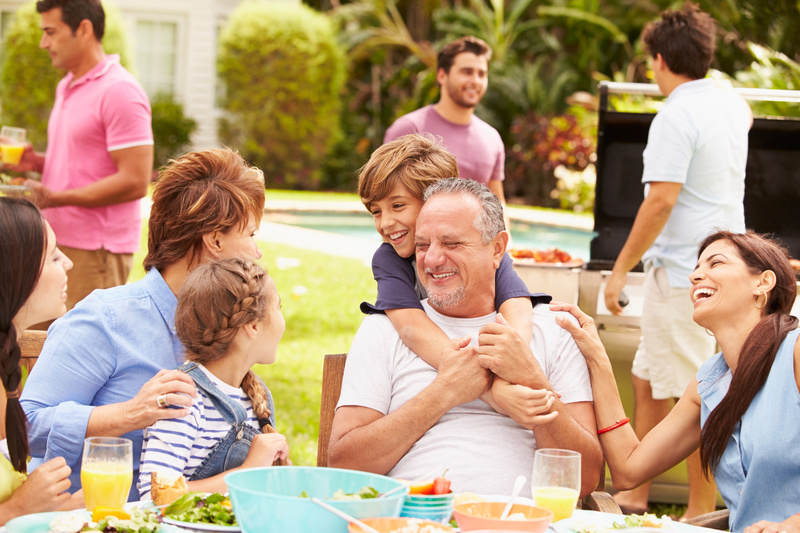 These 8 tips to keep your backyard party hassle-free may just change your mind. Right out of the gate, you can avoid any hassles by filling your guests in on the details of your backyard party. When people know what to expect, it bypasses all misunderstandings and confusion that can throw a wet towel on the fun before it even begins. In the invitation, be clear about what your guests should wear. What time and where they should show up. Where they should park. What time the food will be served. What to expect during your party. What will happen if the weather doesn’t cooperate. When your guests show up already in the know, the only thing left to do is have some fun. Just because it’s your party doesn’t mean you have to do all the work yourself, right? Surely there are a few friends in the crowd who love organizing and setting up for a party. Or maybe a few that owe you for helping them move… now’s a good time to cash in those favors. Invite a few people over early! Ask for help in setting up tables and chairs, or for their expertise in hanging up lights. And make sure to make it fun. When you put on music and make a dance party out of it, it will only seem like the party started early instead of just work. Plus there’s always the incentive of taste testing all the food before the rest of the guests arrive. Plan your menu out early. Knowing what you need in advance will eliminate any last minute trips to the store. Or have your guests bring a dish and make it a potluck! That will also ensure everyone has something they love to eat at the party. Picky eater crisis adverted. Or better yet, hire out some, or all, of the cooking to someone else. We would be happy to cover the sweet treats for you! Nothing says backyard party summer fun like inviting an ice cream truck into the mix. Mother Nature doesn’t always play nice, especially when she surprises you with a pop-up summer storm. Unless you like throwing last-minute parties, it’s wise to have a back-up plan in case the weather turns south. Set-up a covered section of the deck or patio to protect against any rain or unforgiving rays from the sun. If the weather is stormier than that, make sure you have an area of your house that is big enough to hold everyone comfortably. Indoor games will also keep everyone entertained and the fun from getting rained out. It’s common sense – if your guests aren’t comfortable, they’re not going to want to stick around for long. So common courtesy dictates to keep them as comfortable as possible. Make sure you have enough seating for everyone. Set-up fans or misting stations if the weather is particularly hot. Have sunscreen available to avoid sunburns. Play music that isn’t too overwhelming. If it gets chilly after dark, set-up a fire pit (which also comes in handy for s’mores!). Nothing can be as annoying, or gross, then attracting a bunch of uninvited guests in the form of bugs. Finding a fly in your drink or swatting away a swarm of mosquitoes isn’t the form of entertainment you had in mind. And sending your guests home with a bunch of mosquito bites isn’t the best idea for party favors. Set-up decorative citronella candles and torches throughout the entertaining area. You can also have some bug spray on hand for extra protection. It’s also known that mosquitoes are weak fliers. Setting up fans around the area would also help keep them at bay, and cool off your guests. A win-win! No one likes a boring party. It goes along with keeping your guests comfortable – if they’re not entertained, they’re likely not going to stay long. Have some backyard party games set-up. Entertain the kiddos, or the kids at heart, with a bubble station. Let everyone bring a swimsuit for a pool party or to run through the sprinklers. Play an outdoor movie when the sun goes down. Don’t let the fun stop when everyone is finished eating. The food should only be the beginning! A backyard party to remember will be one in which your guest will have something to remember it by. That can take the form of party favors and barbecue leftovers. How fun would it be to have a photo op area, or photo booth, for everyone to take home themed pictures of themselves? Or little gift bags filled with trinkets designed in whatever theme your party is in. And you don’t need to be stuck with all the leftover food! Have to-go containers for your guests to fill up with all the goodies they want to snack on later. That’s a bonus for them, and less clean-up for you. Part of the fun when the weather getting warmer is the ability to enjoy it with family and friends. And with some preparation and thought, your next party can be hassle-free and fun for the whole season. Want to book us for your next party or event? Contact us today! We use only the finest ingredients to create our signature soft serve cones. When you see us, don’t forget to ask about the MEGA CONE. How do you take the perfect ice cream cone and make it better? You dip it in Chocolate, Butterscotch, Oreo Crumble or Blueberry! The Mega Cone is a sweet and crunchy waffle cone piled high with our signature soft serve to take your cone experience to the next level. You like peanuts? We got your peanuts! A crunchy, creamy, combination of peanuts, vanilla soft serve and a generous helping of chocolate sauce. No reputable ice-creamery would neglect this classic banana treat. This combo of vanilla and chocolate soft serve, strawberries, pineapple, chocolate sauce and cherries hits the spot every time. Our ice cream sandwiches are handmade from our signature vanilla or chocolate soft serve. Our premium handmade shakes are made with 100% Canadian Milk and will put even the best shake shoppe to shame. We take the beloved slushie to the next level. Imagine one of our 8 slushie flavors topped with our premium soft serve ice cream and sprinkles. There is nothing more refreshing on a hot day than an ice cold Slush or Iceberg. Not into creamy soft serve, (wtf?) We’ve got you covered! Wash down that amazing ice cream with a refreshing bottle of water or your choice of a varsity of pop.